Gray rats, formally called Norway rats or Rattus norvegicus, don’t have many admirers among people. Norway rats live in close proximity to humans and are responsible for the spread of several types of diseases. Once the rats enter an area, the population can grow quickly. Each female is capable of reproducing up to six times per year. Norway rats have rotund furry bodies with long tails. Tail length accounts for approximately half the total length of the rat. Fur color can be brown, reddish-brown, gray or tan. Norway rats have short pink ears set on a small head. Their round, black protruding eyes aren’t much help when hunting prey, as their vision tends to be poor. They rely on their noses to help them locate food and use their whiskers to help them judge the amount of room available in tight spaces. The rats can grow up to 15 inches long and weigh approximately 1 pound. Female Norway rats are born to breed. They experience heat cycles every five days and may mate a day or two after having a litter, reports the Internet Center for Wildlife Damage Management. Pregnant rats find paper, cloth or other material and shred it to make a soft nest for their babies. Average litter size is six to 12 babies. Baby rats are born tiny, pink and hairless with closed eyes. The eyes open when the babies are approximately 2 weeks old. At approximately 3 month of age, young rats reach sexual maturity and can begin reproducing. Norway rats prefer to hunt for food at night, and although you might not see one if you have a rat infestation, you might notice a few signs that they’re near. Since rats don’t have toilets, they poop whereever it’s convenient. You might find capsule-shaped rat dropping on packages of food and in basements and storage areas. You might see tiny footprints in dusty areas, along with feces. Piles of shredded paper can indicate a nest. Bite marks on wood and piles of wood shavings can indicate that rats have gnawed their way into a building. Rats carry fleas and lice responsible for causing a variety of serious diseases, including typhus, hemorrhagic fever, infectious jaundice and the bubonic plague. 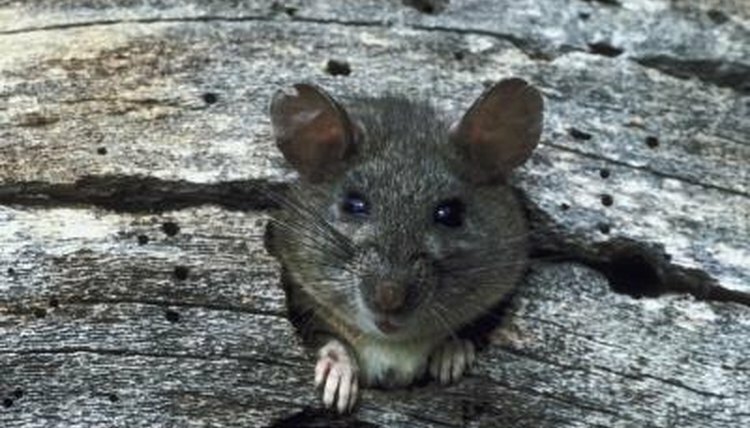 The University of Michigan's Animal Diversity Web site notes that, during the last 1,000 years, more people are believed to have died from rat-borne diseases than from wars. Because rats travel through sewers and eat decaying animals, they also can transfer germs that cause diseases on their feet. People can become sick if they drink water contaminated by rat feces.